Historically, Stratford was a rural settlement but was later transformed into an industrial suburb after the railway was introduced in 1839. It was part of the growth of London in the 19th century, greatly expanding in size and population, where in 1886, became the centre of administration in the Borough of West Ham, and in 1965, part of Greater London. It continued to develop and has changed rapidly over the past few years, making it an important area for sports and a place for many activities. There are a variety of sport activities in Stratford, making it a great place to take part in sports or just to watch all different sporting events. London 2012 Olympic games and Paralympic games took place in the centre of Stratford, and 17 of 26 Olympic games took place just 15 minute walk from Stratford Station. The stadium, after redevelopment, has opened this year becoming the home of West Ham United Football Club and the National Competition Centre for Athletics. The London aquatics centre is a great place for those who love to splash about in water, where you can swim and dive away. Many other sports in the area include badminton in Copper Box Arena, cycling at the Lee Valley VeloPark, and engage in or just relax and watch sport at the Lee Valley Hockey and Tennis Centre. Shopping in Stratford cannot get any better! Westfield Stratford City, is Europe’s largest shopping destination consisting of three-floors and more than 300 shops. Also, for those who love to travel, an exchange foreign currency is at your convenience. Surely after a long round of shopping, getting hungry at Westfield is surely exciting, as there are more than 70 food and drink outlets. You will spoilt for choice from Chinese, Brazilian, Greek, and American food. Westfield’s Stratford cinema is also a fantastic place to socialise and enjoy a movie. It is an all-digital cinema consisiting of 17 screens top choose from. Not only is Stratford an amazing place with bundles of activities to do, it is also a very convenient place for transport. 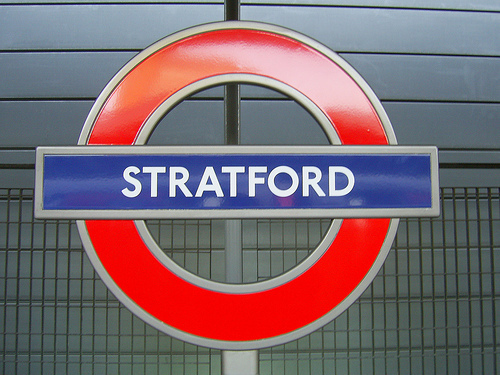 Rail, Tube and bus links are all available around Stratford, making it very easy to travel in and around the area. The Docklands Light Railway, Central line, Jubilee line and London Overground services are all found at Stratford station. Central and Jubilee line is one of the main transport links in this area, which has a fast connection to Central London. To travel even further and faster, Stratford International station links to the South East of London via high speed bullet trains. In addition, travelling by bus is equally convenient in Stratford, as there are many buses from Stratford bus station taking you to a large number of destinations. There are also National Express coaches, travelling across the UK from Stratford bus station.